Le Panoramic - An exceptional view, tranquility assured. Vacation Cottage on the Mountain! With unlimited internet access. 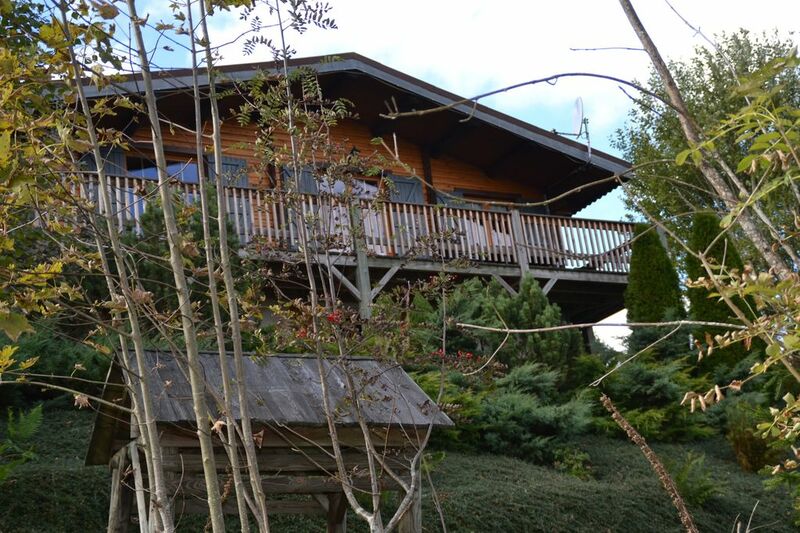 Our chalet 'Le Panoramic' is a Finnish construction in 1985 fully restored in the last two years. The decor was cured by the hostess and many tenants emphasizes customizing our holiday cottage. It enjoys an exceptional view very appreciated by our tenants. Its balcony terrace is equipped with a large table for dining. On sunny days, the sun will invite you to idleness holidays. Its location also gives it a sought tranquility without being isolated so far. Overlooking the village between forests and pastures, it is located in a very quiet area. The hiking trail GR 533 passes the chalet. It can be the starting point for many walks without traveling by vehicle. In the winter, the impasse of lift allows the children or largest to join the tracks on foot which are 150 meters from the chalet. Two ski lifts are located on the area of ​​the station. The slopes are not crowded and it's a great place for learning downhill skiing. The packages are very affordable. However, we advise our tenants to be equipped with chains or snow tires to access our cottage and in other nearby stations. We are located between the two famous resorts of Gerardmer and La Bresse-Hohneck; there must be between 10 and 15 minutes by car depending on traffic conditions. It is an ideal compromise for two families who want to spend a week's holiday together while remaining within the right budget. The value for money that we offer does not include a public looking for the high-end but will satisfy most of you judging the many comments on the HomeAway website. You will have two raclette and fondue dishes, an electric kettle, two coffeemakers (Senseo - filter) and a pressure cooker, a catalytic oven and a ceramic hob. The kitchen is compact and very functional with all electrical appliances. A bar separates the kitchen from the living room. A small laundry room includes ironing board, washing machine and dryer. of sunbathing and a garden table and chairs are available. The terrace is a popular place in the summer of life, the sun dominates the early morning. Still outside, you have a barbecue. Ski storage allows storage of your leisure equipment such as bikes and other accessories ... A cot and high chair. We provide a free supply of wood for the fireplace. Possible purchase of wood. Accompanying me in the mountains, I can guide you for free in an organized outing. Wir (Familie mit 2 Kindern und Hund) verbrachten 1 Woche in diesem netten Ferienhaus. Die Beschreibung und die Bilder des Hauses waren identisch. Der Vermieter war sehr freundlich und nett. Ins Skigebiet nach Gerardmer gelangten wir in ca. 10 Minuten. An der Ausstattung gab es nichts zu kritisieren. Wir benutzten ausschließlich die 1 Etage des Ferienhauses, da das Erdgeschoß etwas dunkel und kühl war. Der Garten ist sehr großzügig und die nahe Umgebung, gerade als Hundebesitzer, sehr schön. Leider waren die Schlafzimmer eher klein und Betten zu kurz. Die Matratzen z. T. sehr weich. Séjour parfait, le chalet est très agréable , chaleureux, bien équipé et parfaitement situé pour de jolies balades. L'endroit est calme, et la vue depuis le balcon est superbe !! Phillippe , le propriétaire est aux petits soins pour ses hôtes ! Merci à lui ! Nous avons apprécié les moments au coin du feu .. et avons eu même la surprise de la neige un 30 Octobre !! Le chalet est situé au pied de la station du Poli, station familiale , idéale pour les enfants !! Nous reviendrons c'est sûr ! et réserverons à l'avance !! Je recommande cette location pour amoureux de la nature et de la tranquilité ! A bientôt Caroline, Benoist et les enfants ! Wir waren mit 2 Erwachsenen und 3 Zwergen in der Faschingswoche dort. Das Häuschen liegt in der Nähe von einem kleinen Skilift, die nächsten größeren Skigebiete sind bei Geradmer und La Bresse und in 15 bzw. 20 Min. gut zu erreichen. Das Haus war gemütlich und sauber und wir haben den Aufenthalt sehr genossen. GERARDMER: 2 Km - Park acrosphère for small and large, tree climbing and zip line course. LA BRESSE HOHNECK, largest ski resort in eastern France at 5 km. COLMAR: 50 km Visit the old town with the popular area of ​​Little Venice. The cathedral and its numerous listed buildings. Farm inn Huss 25 km. At the heart of the valley of lakes, the cottage is located in the commune of XONRUPT-LONGEMER, mountain community which has 1,600 inhabitants. The village with its expansion now adjoins GERARDMER. Lake Longemer (classified area), is 5 minutes from the cottage, there are two equipped beaches and a marked walk that allows to tour the place. The GR 533 passes the cottage, which allows walkers walk from the rental without having to take their vehicle. Poli ski slopes are 150 meters from the cottage, a small way the impasse of lift allows access to children safely. This station for great rates is a good alternative for beginners and intermediate skiers. Two lifts provide access to the upper station. The best known resorts of Gerardmer and the Bresse are located fifteen minutes from the cottage. The cottage is outside the village and is in a dominant position, the relay route that allows them access is a dead end, the daily circulation is low. 50 km from Colmar, the wine road of Alsace and historical sites are within an hour of rental. The two Alpine ski resorts (La Bresse Gerardmer &) are less than 10 minutes from the cottage. Shuttles can be borrowed in Gerardmer but only during school holidays. Nocturnal packages 17 to 22 hours have been set up by both stations. This year the Tour de France cycling stops in Gerardmer. LA CAUTION DE 400 EUROS EST REGLEE DIRECTEMENT AU PROPRIETAIRE A VOTRE ARRIVEE. Le paiement se fait par chèque ou virement bancaire (IBAN propriétaire) La taxe de séjour est de 0.82 cts par nuitée et par adulte. Les arrhes sont payés à la réservation soit 30% du loyer ; le solde est réglé 10 jours avant votre arrivée. Le ménage est obligatoire en présence d'animaux de compagnie. La remise des clés se fait uniquement par le propriétaire. Le forfait ménage de 70 € est obligatoire en présence d'un animal de compagnie. Il est obligatoire si le chalet est occupé en totalité.